Interested in Pursuing Satellite Treatment? For CSO communities contact your team leader. For other utilities or for detailed questions related to the report, please contact Stanley Cach at Stanley.Cach@dep.nj.gov. The focus of the Wet Weather Flow Treatment and Disinfection Demonstration Project's (WWDDP) was to demonstrate the performance of selected technologies to treat for solids removal and disinfection under field conditions at remote, satellite end of pipe locations. The WWDDP established that high-performance satellite treatment is attainable and can be used in appropriate instances to reduce solids and pathogen levels, protect public health and aquatic biology, and can provide a cost-effective alternative for the treatment of combined sewer overflows. 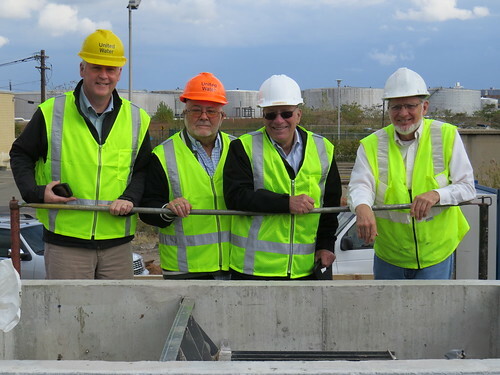 New Jersey continues to make tremendous strides forward in reducing or eliminating combined sewer overflows, controlling solids and floatables, and utilizing green infrastructure to manage stormwater. However, there may be times when the elimination of an outfall or significant reduction of an overflow is not feasible. Engineering analysis conducting in 2005 and 2007 indicated that end of pipe, satellite solids removal and disinfection is a cost-effective alternative to addressing combined sewer overflows (CSOs). Yet, the application of satellite technologies was limited and not fully proven. In the current NJPDES CSO permit, the NJDEP requires CSO permittees to evaluate satellite treatment along with 6 other CSO control alternatives to be considered in LTCP. To advance satellite treatment technology Bayonne Municipal Utilities Authority offered to undertake one comprehensive study that would verify the performance and cost of the latest viable technologies where the results could be used for other CSO permittees. 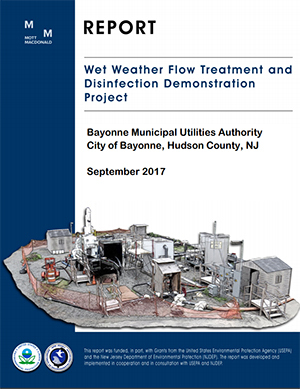 The WWDDP was conducted from 2014 to 2015 at the Oak Street facility in Bayonne which receives combined sewer overflow from Bayonne City. The WWDDP was a collaborative funding and technical effort by the: City of Bayonne, Bayonne Municipal Utilities Authority, United States Environmental Protection Agency, the New Jersey Department of Environmental Protection, Passaic Valley Sewerage Commission, various technology manufacturers, Suez (formerly United Water) and Rutgers University. The Wet Weather Flow Treatment and Disinfection Demonstration Project Report, released in October 2017, discussed the performance data of six technologies and identified a combination of technologies that can effectively treat for varying weather events, hydraulic conditions and pollutants at satellite end of pipe locations. The report demonstrates that wet weather satellite treatment can be a cost-effective option with typically low operation and maintenance costs, with adaptability to multiple locations including constrained spaces and with opportunities for development including public spaces and green infrastructure. The results of the WWDDP represent a valuable addition to data from other pilot and full-scale projects and collectively help inform local decisions on the use of satellite treatment to address combined sewer overflows and stormwater overflow at remote locations.